Introduction: A number of drugs have been tried for the relief of sicca symptoms in Sjφgren's syndrome (SS) with- out much benefit. Lately, oral pilocarpine, a muscarinic cholinergic agent, has been reported to be useful. Objective: To document the effect of oral pilocarpine on sicca symptoms in patients with SS. Patients and Methods: The study group comprised 41 patients (4 men and 37 women) diagnosed as SS (primary or secondary) according to European criteria. Patients were recruited from the rheumatology clinic, cornea clinic, and medicine OPD of AIIMS between April 2003 and March 2005. Study subjects received oral pilocarpine, 5 mg thrice a day for a total duration of 12 weeks. Assessment included measurement of salivary flow, Schirmer's test, Rose Bengal staining of cornea and slit lamp examination at 0, 6, and 12 weeks. Measurement of salivary flow and Schirmer's test was performed twice at every visit, pre-dose and post-dose. All the patients underwent subjective self-assessment of sicca symptoms on visual analogue scale (VAS). Statistical analysis was carried out using paired t-test and repeated measure analysis of variance. Results: The mean age was 52.61 ΁ 9.14 years. Mean duration of dry eye and dry mouth symptoms were 52.02 and 42.51 months, respectively. Treatment with pilocarpine was associated with a significant decrease in the VAS score for dry mouth and dry eye symptoms. Statistically significant increase in salivary flow rate was noticed after the first dose of pilocarpine and was maintained for 12 weeks. Rose Bengal score showed a significant improvement even though Schirmer's test result did not show improvement. The most common side effect was sweating. No serious side effect was noticed. Conclusions: Treatment of sicca symptoms of SS with oral pilocarpine was found to be safe and efficacious. Objectives: To describe the characteristic features of ulcerative subset of cutaneous polyarteritis nodosa (C-PAN) and its response to therapeutic interventions. Methods: Twenty-three biopsy proven cases of C-PAN were treated and followed up for one year or more. Results: A median follow-up of 2 years (range 1 to 16 years) was obtained. Median age and disease duration at recruitment were 35 years and 5 years, respectively. All patients showed irregular chronic waxing and waning, painful and tender nodulo-ulcerative and/or vesiculobullous lesions on the lower leg, periankle area, and/or dorsum of feet. The lesions were bilateral but asymmetrical in severity. Objective joint disease was seen in approximately one-third of patients, mainly in the ankle and occasionally in the joints of the mid-foot with severe destructive disease in 2 patients. Significant neuralgic pains, neuropathy or mononeuritis multiplex were seen in approximately 40% of the patients. Systemic disease with constitutional symptoms and organ involvement was not seen in any patient. Raised erythrocyte sedimentation rate was seen in approximately 40% of the patients. Other laboratory investiga- tions were unremarkable. Different modalities of treatment gave disappointing results; only about 20% patients achieved complete remission and could be successfully weaned off all medicines. A majority of patients continued to follow a fluctuating course with healing and reappearance of ulcerative lesions and gradually progressive scar- ring. Severe aggressive scarring and disfigurement was seen in one patient who was completely unresponsive to any form of treatment. Conclusion: This study confirms that the ulcerative subset of C-PAN is a more aggressive disease with unsatisfac- tory response to standard therapeutic interventions. TNF-α antagonists show differential efficacy in granulomatous disorders. Both infliximab and adalimumab have been shown to be effective in Crohn's disease while etanercept lacks efficacy in this disease. Somewhat similar results have been reported with regard to Wegener's granulomatosis and pulmonary sarcoidosis. It is interesting to note that cases of mycobacterium tuberculosis (TB) occur earlier and more frequently in patients with infliximab relative to etanercept. These observations would suggest that infliximab (and possibly adalimumab) is superior to etanercept in blocking granulomatous inflammation. However, no conclusive data are available at present. Three attributes of the TNF antagonists are crucial to understanding the observed differences: mode of administration, the IgG antibody backbone and the nature of TNF-α binding. Infliximab (and presumably, adalimumab) is able to bind transmembrane TNF with greater avidity than etanercept. Besides, the two TNF receptors (p55 and p75) exhibit complex interactions involving the binding of TNF. Also, TNF receptor signalling pathways are mutually influenced by effects of other TNF receptors (e.g. TRAIL, FAS, CD40). It has been shown that p55 TNF receptor conveys both survival and death (apoptotic) signals, while the p75 receptor is thought to mostly convey survival signals, yet plays a clear role in Fas- FasL mediated apoptosis or activation induced cell death. On the basis of results of available studies one can conclude that a) acute administration of infliximab reduces inflammation and cellularity through apoptotic and non-apoptotic pathways, which vary as a function of organ and or disease process, b) chronic administration of infliximab and etanercept can induce macrophage apoptosis and this correlates with clinical response, arguing against a specific role for transmembrane TNF binding in inducing apoptosis, c) either methodologic or organ system differences must account for the differential findings in vitro, and d) although it is likely pharmacokinetics and pharmacodynamics play some role, only studies specifically designed to address these questions will resolve these issues. The natural history of Complex Regional Pain Syndrome (CRPS) is not well understood and the progression varies between different patients. The pathogenesis of this disorder is not well understood and a single mechanism can barely account for all the changes that are seen. In the absence of any pathognomonic sign or investigation, the diagnosis is suggested by the presence of constellation of symptoms, signs and laboratory findings. It is often under- diagnosed and undertreated resulting in significant morbidity and impaired quality of life. The crux of management lies in formulating a multidisciplinary planned approach based on the principles of chronic pain management, reha- bilitation and psychotherapy with physiotherapy playing a very important role. Corticosteroids might be useful in a select group of patients in the early stages. Long-term use is not recommended as it has a questionable risk-benefit ratio. A number of new drugs are being tried that include thalidomide, calcium channel blockers, free radical scav- engers, oral sympatholytic drugs, and clonidine. Encouraging results have been seen with bisphosphonates. Lenalinomide and neurotropin are other newer agents undergoing evaluation for efficacy in CRPS. Owing to lack of proper understanding of the pathogenesis and lack of animal models, current treatment for CRPS is essentially symptomatic and suboptimal. This paper attempts to review the role of various therapeutic modalities in the manage- ment of CRPS with emphasis on the emerging therapies. 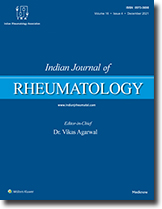 Atherosclerosis has emerged as the leading cause of long term morbidity and mortality in inflammatory rheumatic disorders like rheumatoid arthritis and systemic lupus erythematosus. In addition to traditional risk factors such as smoking, hypertension, diabetes mellitus and dyslipidemia, non-traditional risk factors like anti-oxidized LDL anti- bodies, interleukin 6 and anticardiolipin antibodies may play a key role in causing accelerated atherosclerosis, which is common in these disorders. It has been shown in animal models that both humoral and cellular immune mecha- nisms are involved in producing atherosclerosis. Endothelial cell injury, believed to be the triggering factor in atheroma formation, can be produced by several of the inflammatory mediators whose levels are characteristically elevated in rheumatic disorders. Using measurement of carotid intima media thickness as a tool, clinical evidence of premature and accelerated atherosclerosis has been found in both rheumatoid arthritis and lupus. Similar findings have been reported in the antiphopholipid antibody syndrome and certain vasculitides. Patients with rheumatoid arthritis have a 3.6-fold higher risk of developing coronary artery disease as compared to controls and this risk may be as high as 50-fold in systemic lupus erythematosus (SLE). Control of modifiable traditional risk factors like hypertension is crucial to lowering this risk. It has also been suggested that adequate control of the inflam- matory process which is a part of the underlying disease, may also reduce the incidence of coronary artery disease.